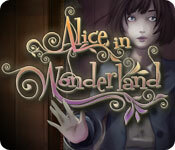 We've uploaded an extensive collection of screenshots from the beautifully illustrated hidden object fantasy adventure game, Alice in Wonderland. Alice in Wonderland features the essential characters of the original Alice's Adventures in Wonderland by Lewis Carroll (the pseudonym of Charles Lutwidge Dodgson), but is more magical and more menacing. To a lesser degree, the key actions and locations of the original are also featured, such as shrinking down to pass through a too-small door, but the locations are very different from the story as we know it (and popularized by Disney). Because the essential action is a hidden object game, and the protagonist no longer Alice, the characters in this somewhat short game come across as cameos rather than essential figures. 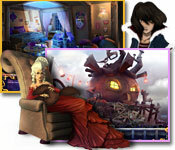 The puzzles will probably play as either too-easy or too-hard, and sometimes just plain tedious (such as several connect-the-gears type puzzles which thankfully can be skiped), and the hidden object games surprisingly easy except for one or two objects that are near-impossible to find because their silhouettes are so lacking. Overall the game is a cut above the screens-cluttered-with-garbage type early hidden object games, but could use voiceovers and a better soundtrack. There's a good story here, though perhaps not as well or suspensefully told as it deserved to be. The fantasy artwork however, is very different and very good for its genre and definitely deserves a look.